Life groups at Blainsport exist to help people grow to full maturity in their relationship with God and with others. When asked what was most important, Jesus basically said, “Love God and love people” (Matthew 22:37-39). So that’s what we are going for in our Life groups. God wants to do two fundamental things in our lives. First, he wants to have a relationship with us. 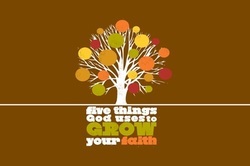 The second thing He wants to do is help us grow up spiritually. Well guess what, life-change and growth happens best with a small group of people encouraging, supporting and challenging each other. Life groups are small groups of 5-15 people gathering every other week to study God’s Word together, pray together and share life together. Life groups meet in homes where each person can share their joys and challenges in a warm environment. Over time, the people in your Life group become a close family. In a Life group, you can lean on each other for encouragement, support and friendship in the real world. Our lives are lived more purposefully when we gather together in Life groups. We grow closer to Christ and each other when we share life in this setting. If you only attend church on Sunday morning but do not connect with other believers during the week, then please consider joining a Life group. We were created to connect relationally and when we don’t have that, life just doesn’t feel quite right. In a Life group you can connect relationally with God and others.